Excellent textbook dealing with latest developments in: (a) new concepts to analyze the urban catchment hydrology for storm runoff predictions, (b) innovative methods to estimate the street allowable capacities to convey storm runoff, and (c) useful computer models to simulate flow movements in inlets and sewers. This book deals with the latest developments in: (a) new concepts to analyze the urban catchment hydrology for storm runoff predictions, (b) innovative methods to estimate the street allowable capacities to convey storm runoff, and (c) useful computer models to simulate flow movements in inlets and sewers. These new concepts include the revised Rational method to quantify the flow increases due to urban development and is an imperviousness-based approach to reflect the impact of urbanization on the increase of peak flow. In addition, the decay-based clogging factor was presented in this book for single to multiple inlets. As a recommended in the new approach, the clogging factor shall be applied to the length for weir flows or to the area for orifice flows. In this book, it is recommended that the flow capacity in a street be evaluated by the gutter-full flow capacity with a discharge reduction. Photos and figures illustrate how and why the engineering approaches were derived from and applied to street drainage designs. More than 100 real world design examples are used to illustrate the methods and procedures. Many design procedures presented in this book have been converted into Excel Spread Sheets. 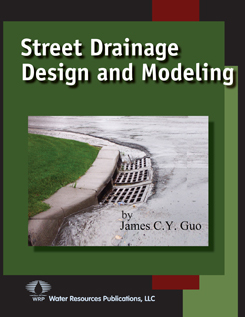 The latest computer model of UDSEWER is introduced in this book as an efficient tool to design a sewer system using the mixed flows among open channel flow, surcharge flow, and pressure flow in a system. It calculates hydraulic and energy grade lines with consideration of friction loss, bend loss, jump loss, and manhole loss. On top of flow hydraulics, UDSEWER summarizes the excavated earth volumes for the entire sewer system for future cost estimation. These efficient tools can be downloaded free-of-charge from the website: www.udfcd.org. This book has been developed for graduate classes and senior design courses and many of the design methods documented in it have been adopted as the recommended design procedures by Denver, Las Vegas, and Sacramento metropolitan areas in the United States. For additional information, go to: www.udfcd.org..
8.2.2. - Energy Analysis from Section 2 to Section 3.